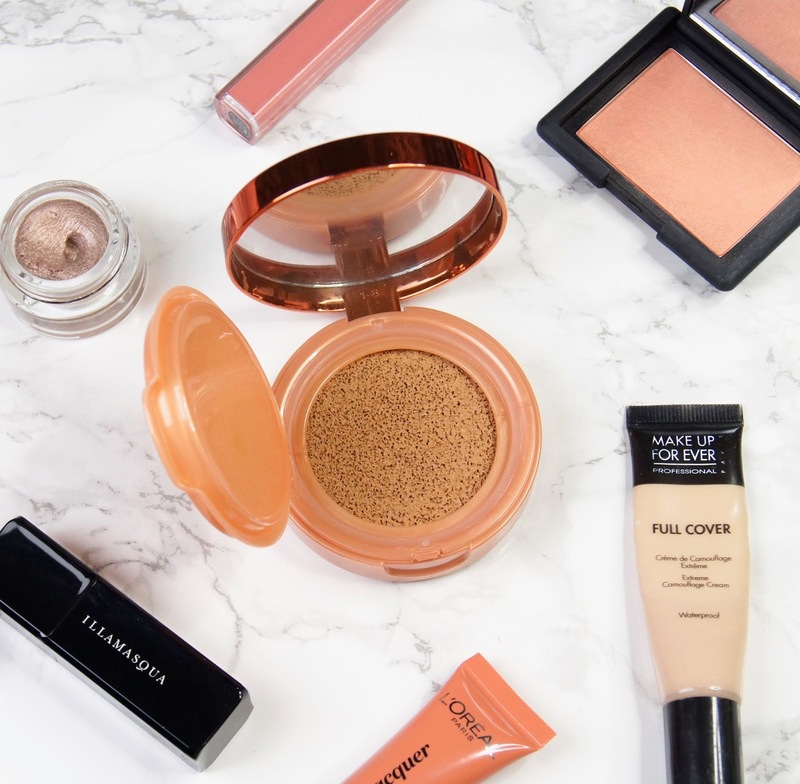 I love using cream products all year round for a more dewy look to my makeup and cream/liquid bronzers are no different. They're ideal for the summer, when you want that glowing sun-kissed look, but they're perfect to use in the winter also, when skin needs a bit of a colour boost and craves every little bit of extra hydration it can get. 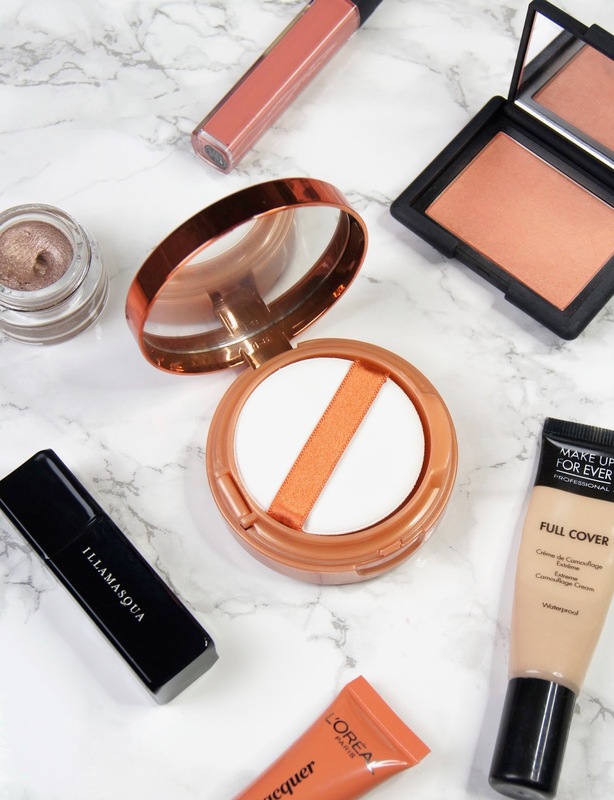 I've actually been through three of these L'Oreal bronzing cushions since they first launched and, now that I'm on to my fourth, I've realised just how much I'm obsessed with this bronzer. Consistency-wise, the L'Oreal Glam Bronze Cushion De Soleil Fresh Glow Bronzer has a very creamy formula and lightweight texture, unlike Chanel's Bronzing Base which is more firm and gel-like. Exactly like the compact says, it feels fresh and hydrating on application. It's in no way thick, sticky or heavy and you can't feel it sitting on the skin at all. Once the bronzer has settled on the skin, it doesn't dry down totally. If you avoid powdering over the top of it, it continues to stay dewy as the day goes on, without looking unflatteringly shiny. It's not a cream-to-powder formula, that's for sure. As it's so smooth, the Fresh Glow Bronzer blends so easily. I expected the sponge applicator to be pants if I'm honest, but I actually love using it with this bronzer. All it takes is a few taps of the sponge and it melts into the skin seamlessly. If I want a softer finish, I'll either work the product in a little more with my fingers, or I'll buff it on with a brush. If I'm out or in a real rush, using the sponge alone is a life-saver. 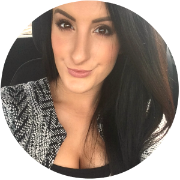 No matter how I apply it, the bronzer melds with the skin effortlessly with no patchy result. It builds really well too, without bunching up or looking cakey as you add layers. It doesn't cause my base makeup to move around underneath, either. 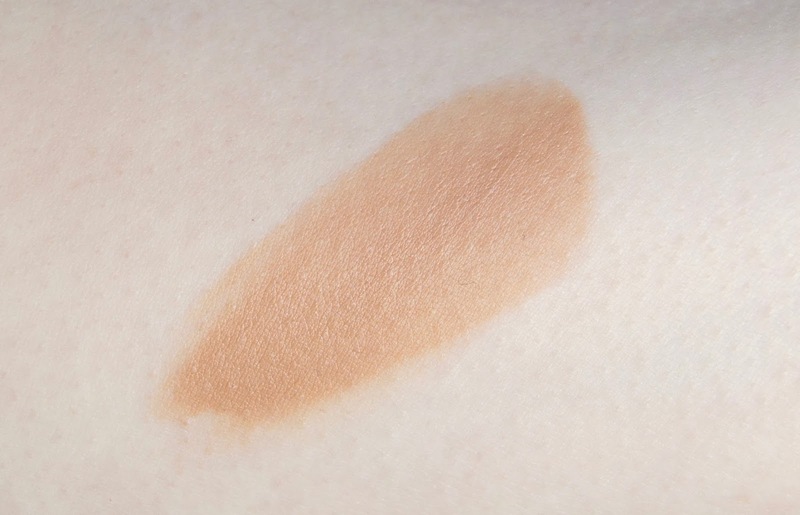 Although it's doesn't offer any coverage like a foundation, the bronzer does even out the skin-tone and creates a soft-focus blurred effect on the skin. It's so smoothing and, because of that, I've been wearing it alone on relaxed days, without the need for applying a full face of foundation as well. If I'm spending a day running errands or I'm heading to the gym and don't want to look like a total zombie, I'll use it as a bit of a skin pick-me-up. It's super quick and just gives my ghostly winter visage a bit of healthy colour, all whilst still looking totally natural. Most importantly, the colour of the bronzer is lovely and works really well for light to medium skin-tones. But, there's only one shade available. 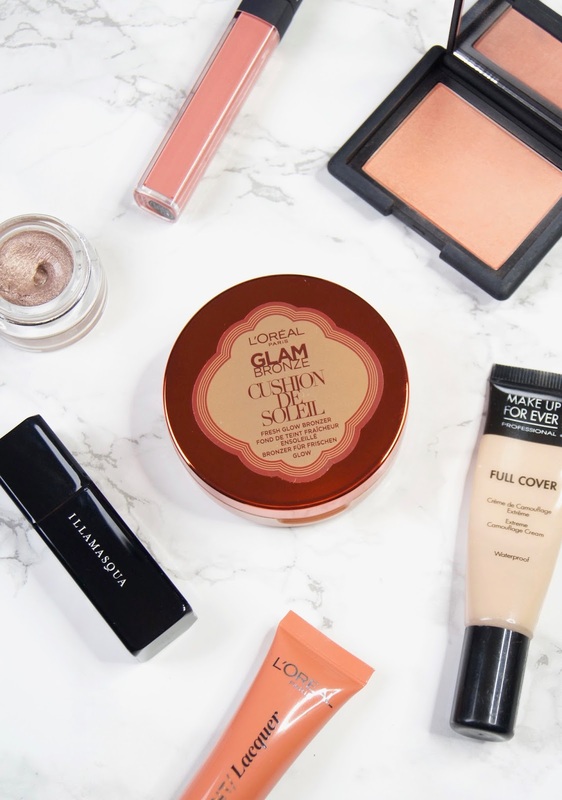 L'Oreal do claim that the Glam Bronze Cushion De Soleil Fresh Glow Bronzer has a universal shade that suits all skin tones, however I'm not sure how well it would work for anyone with a much darker complexion. I know a lot of people with fairer skin find the Chanel Bronzing Base to lean on the orange side, but the colour of L'Oreal's cushion finds the perfect balance between a bronze tone and a natural olive colour. Initially, it can look quite intense and muddy, but I assure you it blends into a gorgeous wash of warmth. Nothing severe, just a subtle, healthy glow. Of course, you can apply as little or as much as you want to achieve your desired level of colour. At £14.99, this bronzer is definitely creeping towards the more expensive end of the high-street beauty spectrum. But, L'Oreal is generally one of the pricier drugstore brands, so that's no surprise really. To be fair, the formula is so nice that I think it's worth it and it's certainly a whole lot cheaper than some of the high-end cream bronzer options out there. Although the L'Oreal Glam Bronze Cushion De Soleil Fresh Glow Bronzer may not last as long as a pot of Chanel Soleil Tan De Chanel, it definitely lasts a lot longer than I thought it would, with the sponge remaining saturated with product for a good few months when used regularly. You just need to make sure you close the lid properly to prevent the sponge from drying out! 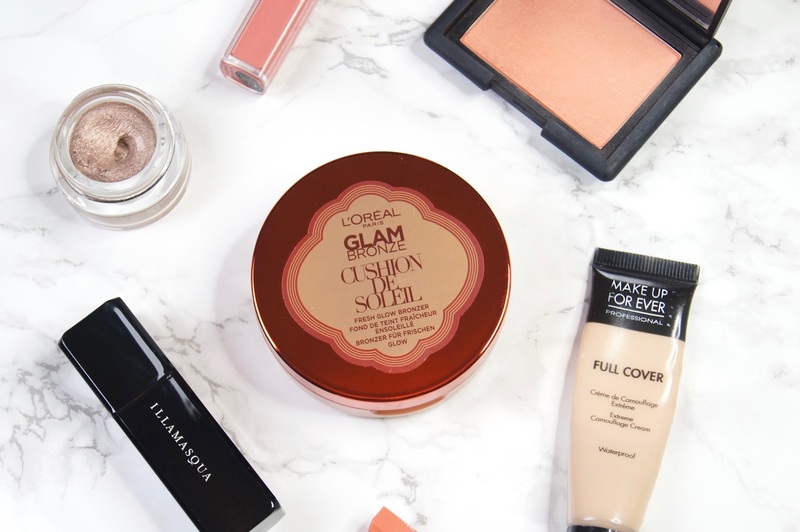 Have you tried the L'Oreal Glam Bronze Cushion De Soleil Fresh Glow Bronzer? Oh wow that bronzer looks so cool! Never tried anything like it. This looks so good, I haven't tried anything like this before so I might have to give it a try!